Old Towne in Republic MO, outside of Springfield MO, is divided into two separate ballrooms that can either be used individually or combined for one grand event/party. The Brandt Pointe Ballroom boasts capacity for up to 350 guests and has an elegant/chic loft feel with 5 beautiful chandeliers, wood floors and lots of natural light. Our smaller capacity Sankaty Ballroom will seat 150 of your guests very comfortably and has a slightly warmer touch with copper chandeliers completing the space along with natural light and wood floors. Rent the Sankaty Ballroom for your ceremony and Brandt Pointe for your reception or change it up however you'd like. We want you to feel welcome in our space so let us know how we can help make those dreams come true. You can also check out our website for our ghost chair rentals! We rent out ghost chairs that work with any wedding venue or event location! We offer wireless internet access, plenty of space for on-screen projections, and acoustics that promote audio clarity. 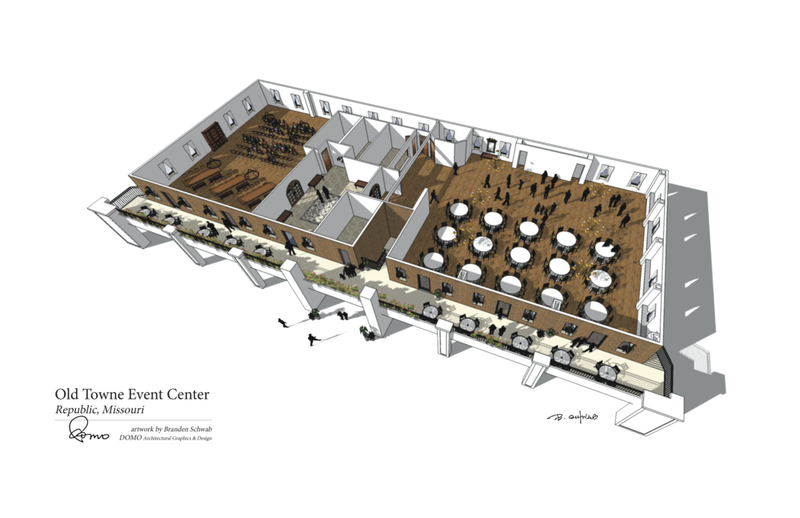 All these features come together to make the Old Towne Event Center a fully equipped venue for your upcoming event. Old Towne Event Center sets the tone for urban, chic, and contemporary fashion shows. The main event space houses a gorgeous setting for a red carpet runway. Call Amy today to take a tour and book your fashion show event, 417.848.3908. Take your upcoming corporate event to the next level by partnering with the Old Towne Event Center. An elegant warehouse feel with modern elegant amenities conveniently placed along Highway 60. Holding capacities from 25 to 500 guests, the Old Towne Event center is the perfect setting to treat your employees, colleagues and guests to a professionally-catered conference, seminar, team building session, holiday party or training event at our state of the art facility. For an added benefit, our rental space is located on a private floor free of through traffic which enables our guests to simply enjoy their event without hassles or interruptions. We look forward to booking your event. Contact us for a tour.